PESHAWAR: Youth from Federally Administered Tribal Areas (FATA) welcomed participants of a long march from Dera Ismail Khan to Peshawar on Sunday. The march started on January 26 to protest against the murder of Naqeeb Mehsud, who was killed in fake encounter by Karachi police. 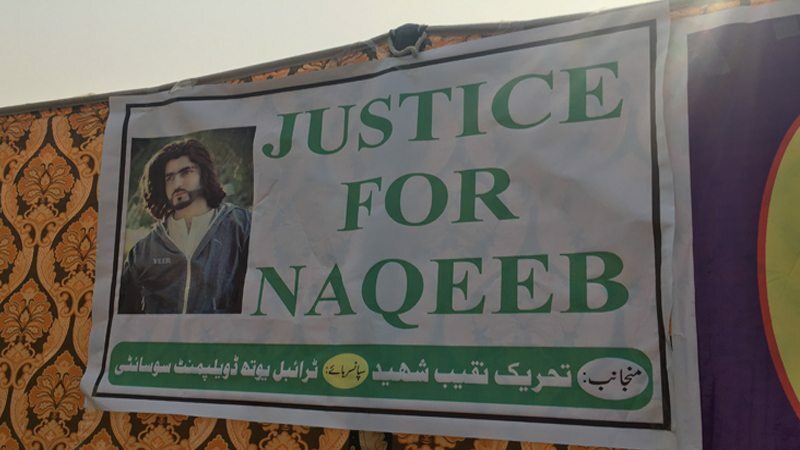 The local residents, students, and tribal elders set up Naqeeb Shaheeh Camp at Phase-III Chowk Hayatabad to protest against Naqeeb’s killing. The caravan will stay in Peshawar and then head to Islamabad with the hope of joining hundreds of locals, including male and female students, political workers and civil society. Shaukat Aziz, a student leader, said that more people would join the protest as they moved closer to Islamabad. Aziz requested all Pashtuns to come out from their homes to protest against the murder. “Killing of Naqeeb Mehsud in a fake encounter will awaken all Pashtuns,” Shaukat said. Aziz and his student colleagues are hoping to march towards Islamabad with a huge number of protesters. Athe Naqeeb Shaheed Camp, tribal elders delivered speeches against the Karachi Police. Dr Said Alam Mehsud is a strong voice against fake encounters in the province. He criticised the role of powerful institutions in the country, “Rao Anwar and the likes of him have alienated the Pashtun community,” he said. “Being Pashtun is now sin in this country. They are being abducted for ransom. They often go missing. Then the police announces that they have killed a terrorist in a fake encounter. We condemn the institutions’ negative role in alienating Pashtuns,” he said. Rizwan Bahar comes from Waziristan. He is an Mphil scholar at University of Peshawar. He joined the gathering along with his tribal student colleagues. “If Rao Anwar is not brought to justice, then we will consider this act of barbarism a systematic genocide,” Bahar stated. Women from tribal areas also joined the camp and welcomed the marchers and assured them of their support. Dr Said Alam Mehsud said that the murderer had not been arrested so far. “Rao Anwar talks to the media without any fear, but the law enforcement agencies are unable to trace his location and arrest him. This is pathetic,” he said. “Rao Anwar and his fake encounter team is mocking the writ of the state and also staring into the eyes of this senseless state without any fear,” Dr Alam Mehsud said. Manzoor Pashteen, a Gomal University student and organiser of Mehsud Tahafuz Movement (MTM), who led the long march from DI Khan to Peshawar thanked the residents of Peshawar. Manzoor Pashteen had gone missing for few days before Naqeeb Mehsud’s killing for raising a voice against land mines and disappearing of Pashtun. “Enough is enough. The state is responsible for killing of Naqeeb Mehsud,” he said. “This movement will not stop. The fake encounter specialist should be arrested,” he added. “In seven tribal agencies and frontier regions, the youth have initiated of collecting data of missing persons. The data contains shocking revelations which would be unveiled in near future,” he said. Pashteen also raised the issue of land mines in tribal areas. “Every month our kids die or became paralyzed due to the land mines,” he said. Published in Daily Times, January 29th 2018.